It’s already this Saturday 29 that I’ll be hosting the first AzureML hands-on workshop in Portugal. It has been a pleasant surprise to see that it’s filling up rather quickly, much to thanks to the restless SqlPort community team (Particularly Niko & Paulo amazing work… allowing me to fully focus on the workshop itself… more pressure for sure… no excuses!). I’m rather curious to see how it goes, as there will be for sure an interesting mix of profiles attending this workshop. And I hope that will contribute to make this a very interactive, personally demanding but enjoyable day! The event is organized by SQLPort, all the resulting revenue will revert to community support & upcoming events. Check out the workshop agenda below or in the event page here . The event will take place at Microsoft Portugal. Also disclosing that every participant will be granted access to my very own personal notes & best highlights on some of my favorites data books… (go to love Amazon/Kindle platform) all of which I’m reviewing right now ;) . Full one day hands-on workshop including introductory course to Machine Learning process, use cases, models & algorithms and also how to model, test & deploy Machine Learning solutions with the new Microsoft AzureML cloud service. The idea for this sample goes right back to the initial releases of the Excel Data Mining Addin. Now that’s a cool Excel Addin, in fact it’s way more valuable today and it’s a little sad that data mining is even a little bit forgotten in the MSBI stack :( (yes, it is…). The issue with SSAS Data Mining, particularly this addin I think… it really was ahead of its time! because now, in our always changing data driven world, it’s the time for such agile & self service data mining/data intelligence scenarios. Anyway, that Addin showed that is was possible to do 100% dynamic outlier detection based only on the given data/schema. Models would be generated in runtime for each dataset. And so, finally, we had the time to take this concept and turn to PowerShell to make a lot of other data driven scenarios scriptable & able to run completely automated (ex: scheduled/intelligent alerts/trends/anomalies monitoring). So, what if we could use this to monitor several data streams we have available in our solutions? We already have & use several very agile & data driven kpis/reports/datasets… but that still usually involves fixed alert thresholds, what if we would have something looking at these data streams every day and tell us, “hey, here’s something that’s not usual, are you aware?”? (ie something that would do what I usually do, so that I can go on doing several other things… like blogging and reading :) ). 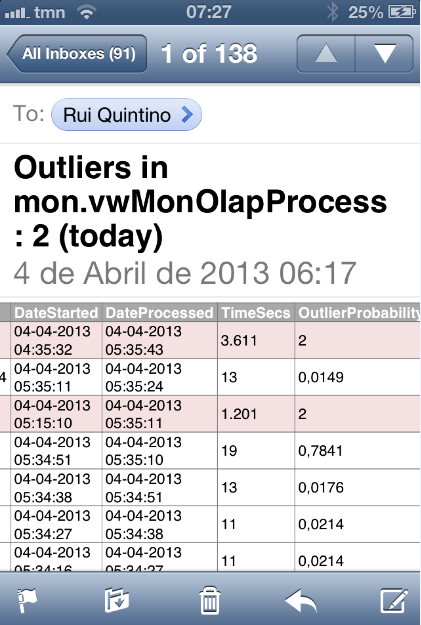 A schema (mon) where I can put the data streams I want to monitor for outliers/anomalies. As a sample I use a dataset of SQL Analysis Services processing logs/elapsed times, by object (measure group, partition, dimension,…). 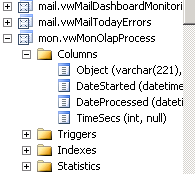 Ensure that I have a date column to allow for proper date/time filtering-after the outlier detection-, (1 month old outliers aren’t that interesting anyway). How cool is that? :) The script doesn’t know have to know the data in anyway, anything goes, that’s the beauty of it. That’s it for today, browse/get the sample at http://devscopebisamples.codeplex.com ! Note that there’s a bundle download available with Excel Data Insights AddIn, Mail DataTable Reports & this outliers sample. ps-and don’t tell my boss that PowerShell & Data Mining is doing our work now! ;) We’ll figure out something else to do eventually….